A Passion To A Principle constitutes Lynette Yiadom-Boakye first institutional solo show in Switzerland. The exhibition, on view at Kunsthalle Basel, identifies many of her signature themes: a figurative painter, her luminous canvases are filled with mostly black figures notable for their unbeknownst ambiguity. She paints these figures from memory, sketching and foraging ideas with suggestive narratives, though the subjects in her compositions are not models. Rather, devoid of any personal relationships with the artist or themselves, Yiadom-Boakye’s characters are created to fill a contemplative void—the paintings serving as a notion of probable intentions and perceptions. Belonging to a distinctive tradition of British school of painting, Yiadom-Boakye is a classist in her practice. Although she follows the basic principles in painting, there remains a tergiversation of forms within her work. She frequently abandons concepts and uniformity, erasing the spectrum of fact or fiction in her lyrical paintings. This survey of twenty-four recent works highlights her unique compositions, including both intimate and large-scale paintings, setting the stage for a series of moral debates and speculations: who am I looking at? What are they looking at? Are we to delve into to canvas to understand and contemplate the scene before us? Or do we as the audience remain distant as a viewer taking it all in at face value? Lynette Yiadom-Boakye, Harp Strum, on view in A Passion To A Principle at the Kunsthalle Basel, 2016. Courtesy the artist; Corvi-Mora, London, and Jack Shainman Gallery, New York. Yiadom-Boakye dresses up her subjects enabling them to play different roles on the canvas by abandoning historical or contemporary context. Clothes and costumes plays a characteristic guise within her oeuvre, artfully drawing upon her influences to borrow from historical painters such as John Singer Sargent, Édouard Manet, Diego Velázquez, Frans Hals, et al. In The Hell for Leather on a Hound (2016), we see Yiadom-Boakye’s innovative technique, as she illustrates a black male figure dressed in a charcoal blazer and grey jumper. He is casually lying back on what could be a couch, his gaze slightly averted from the viewer, against an indistinguishable background. While the artist never suggests a grand narrative, the titles of her canvases allows for discernment and guidance through figurative observation. For the most part, the paintings in this exhibition transform their cool and polished style to reveal an intellectual quality. 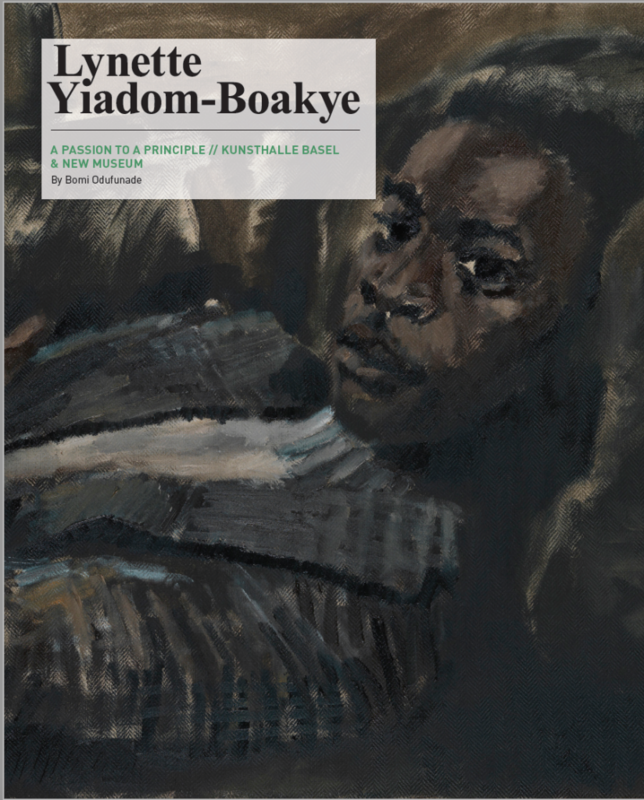 While Yiadom-Boakye makes no attempt to present us with allegory or meaning, there is an appreciation in the simplicity of her undertaking; her visual vocabulary is never limited. Lynette Yiadom-Boakye, A Culmination, on view in A Passion To A Principle at the Kunsthalle Basel, 2016. Courtesy the artist; Corvi-Mora, London, and Jack Shainman Gallery, New York. In A Culmination (2016), a quartet of sleekly attired men are dressed in suits in shades of green and crisp white shirts. They pose as if they are the aristocratic subjects of an Old Master group portrait, though could just as easily pass for a cover album of a boy band. While three of the arrayed men look at each other, one of the group offers an auspicious stare directly towards the viewer. We are left to wonder about the possible interpersonal relations amidst the suavity of Yiadom-Boakye’s forms, and the instinctiveness of reticence in her consistency of color and brushwork. 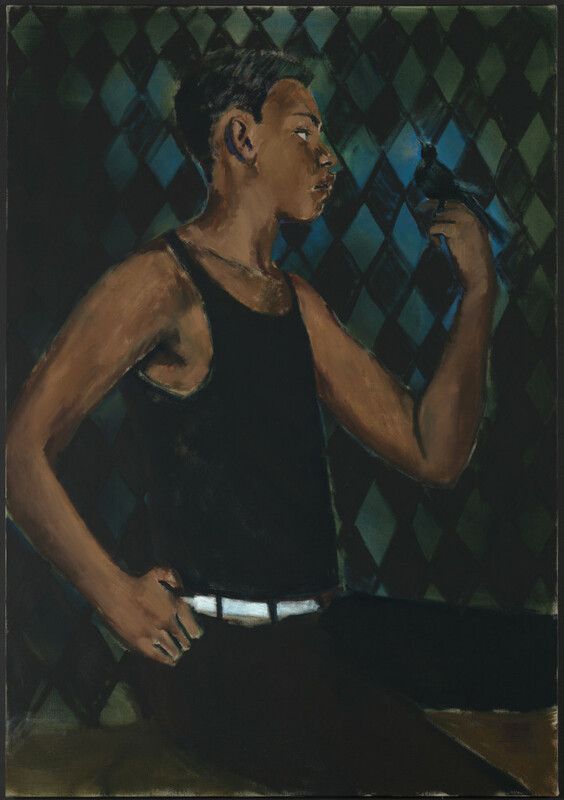 In Lute Music to a Heathen (2016), she paints a portrait of a black man seated facing sideways, looking away from his viewer; the sitter is dressed in black sleeveless t-shirt and trousers accentuated with a white belt, one hand tucked into his trouser as another holds up a small bird against a monochrome harlequin background. Echoing the Post-impressionists, Butter in the Eaves (2016) has a young man lounging with his back to wall, seated on a stripped carpeted floor while adjacent to him is a white vase of sunflowers. Each work depicts a tender scene, poetic and subtle, offering compelling attention however coupled with idiosyncratic considerations; this composed structure affirms a play with perspective and dimensionality which attests to the artist’s preoccupation with the technical aspects of painting. Artists Edgar Dégas and Walter Sickert had similarly recurrent influences on Yiadom-Boakye’s work; both were ‘painters-in-ordinary’ with their omnivorous depictions of modern life. Dégas’ dancers  have been of particular interest to the artist, which is demonstrated in a trio of paintings in the exhibition—Harp-Strum, Militant Pressures, and Tell The Air (2016)—a sequence of vivid studies of female subjects mid-performance. Lynette Yiadom-Boakye, Lute Music to a Heathen, on view in A Passion To A Principle at the Kunsthalle Basel, 2016. Courtesy the artist; Corvi-Mora, London, and Jack Shainman Gallery, New York. 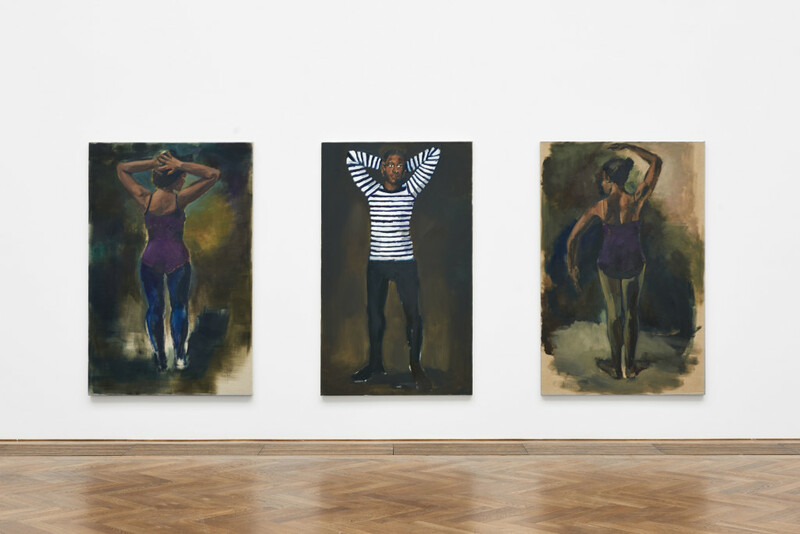 Lynette Yiadom-Boakye, A Passion To A Principle was on view at Kunsthalle Basel from November 18, 2016–February 12, 2017 and her solo exhibition, entitled Under-Song For A Cipher, on view at the New Museum in New York runs through September 3. 2017. 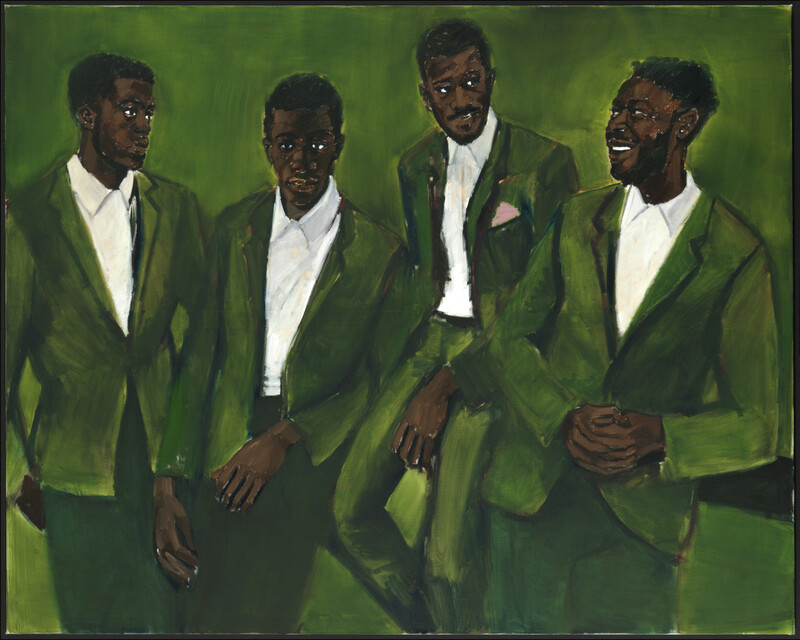 May 23, 2017 | Filed under Art Seen: International, PAST ISSUES and tagged with Bomi Odufunade, Lynette Yiadom-Boakye, New Museum, New York City, The Seen.